"Where can I put my Washing Machine?" is a very common question that every Homebuilder asks his Architect. Traditionally, Kerala homes had designated washing areas- a large bathroom attached to the well, with the large washing stone. 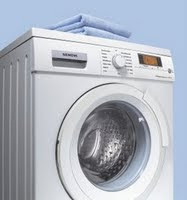 The sound of clothes lashed on the stone has now been replaced by the rumble of the Washing Machine's motor. Although most new homes just have a convenient niche for the Washing Machine, the concept of a Full-fledged laundry room- with washing, drying and folding done there, is gaining popularity. Avoid placing the washing machine in a high traffic area such as the kitchen or garage. Avoid combining the laundry room with another room. For example, do not combine the laundry and a children's study room in one area. The master bedroom should never have the washing machine in it. It will not be calm and peaceful if you have to look at dirty clothes every time you go to bed. 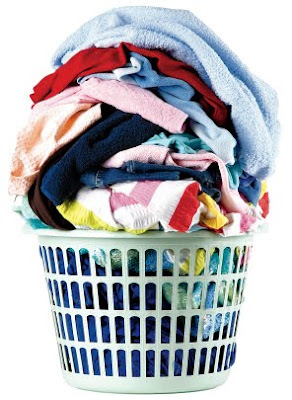 Place the washing machine as close as possible to the largest source of dirty laundry. The most household laundry normally comes from the bedrooms where, of course, the clothes are kept and changed. 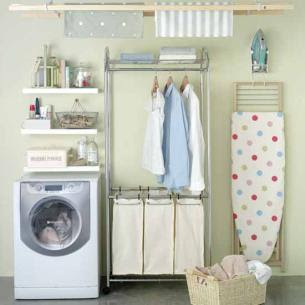 Add a cupboard or shelf over the washing machine to allow for storage of laundry supplies - and detergents. Always install shutoff valves at your machine's water supply in case of leaks or the need to move the machines for repair. Do not give a direct connection from the plumbing, without valves. Leave extra space in the area where the machines are installed. Do not create a custom size space that is only suited for a specific model of washing machine because someday if the machines need to be replaced you may not find a model with the same measurements, or you may need a larger one. If you have a separate Laundry Room, you can even opt to add insulation to the wall and floor area of the laundry room to lower the noise level. Since green building is still a relatively new process, it's a good idea to research green building on your own so you know what to look for when choosing your site, home plan, builder and sustainable products. • Location: New green homes and neighborhoods must not be built on environmentally sensitive sites like prime farmland, wetlands and endangered species habitats. The greenest development sites are "in-fill" properties like former parking lots, rail yards, shopping malls and factories. Be sure to study your property carefully so you can put the sun to work for you and your home. When it comes to clearing your lot, take down only the necessary trees and bushes. The trees you leave behind will act as a shade barrier in the summer months and wind barrier in the colder months. • Size: No matter how many green building elements go into your home, a 5,000-square-foot green home still consumes many more natural resources than a 2,000-square-foot green home. The larger home will also require more heating, air conditioning and lighting. If you really want a sustainable home, choose a smaller size. • Building Design: The home should be oriented on its site to bring abundant natural daylight into the interior to reduce lighting requirements and to take advantage of any prevailing breezes. Windows, clerestories, skylights, light monitors, light shelves and other strategies should be used to bring daylight to the interior of the house. The exterior should have shading devices (sunshades, canopies, green screens and — best of all — trees), particularly on the southern and western facades and over windows and doors, to block hot summer sun. Dual-glaze windows reduce heat gain in summer and heat loss during cold winter months. The roof should be a light-colored, heat-reflecting Energy Star roof, or a green (landscaped) roof, to reduce heat absorption. • Green Building Materials: A green home will have been constructed with healthy, non-toxic building materials and furnishings, like low- and zero-VOC (volatile organic compound) paints and sealants and non-toxic materials like strawboard for the sub-flooring. Wood-based features should come from rapidly renewable sources like bamboo. 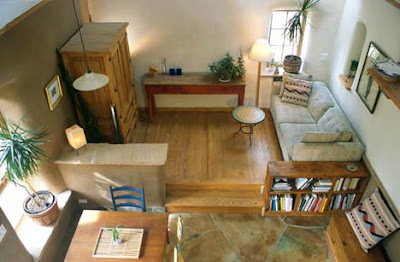 A green home uses salvaged materials like kitchen tiles and materials with significant recycled content. • Insulation: A non-toxic insulation, derived from materials like soybean or cotton, with a high R (heat resistance) factor in a home's walls and roof will help prevent cool air leakage in the summer and warm air leakage in the winter. • Windows and Doors: Windows and exterior doors should seal their openings tightly to avoid heat gain in summer and heat loss in winter. • Energy Efficiency: A green home has energy-efficient lighting, heating, cooling and water-heating systems. • Renewable Energy: The home should generate some of its own energy with technologies like photovoltaic systems. • Water Efficiency: A green home has a water-conserving irrigation system and water-efficient kitchen and bathroom fixtures. Look for a rainwater collection and storage system, particularly in drier regions where water is increasingly scarce and expensive. • Indoor Environmental Quality: Natural daylight should reach at least 75% of the home's interior. 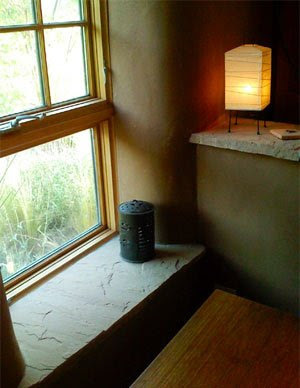 Natural ventilation (via home orientation, operable windows, fans, wind chimneys and other strategies) should bring plentiful fresh air inside the house. The HVAC (heating, ventilation and air conditioning) system should filter all incoming air and vent stale air outside. The garage should not have any air handling equipment or return ducts, and it should have an exhaust fan. • Landscaping: Vine-covered green screens, large canopy trees and other landscaping should shade exterior walls, the driveway, patios and other "hardscape" to minimize heat islands. Yards should be landscaped with drought-tolerant plants rather than water-guzzling plants and grass in most regions. As consumers continue to learn more and more about green building, architects, designers and builders are starting to incorporate more green features into their new homes. Thanks to new technology and products, consumers can build their dream home without sacrificing aesthetics. Even though everyone in the home building industry is buzzing about the term 'green' building, many consumers are still confused as to exactly what it means to build a green home. Some of the benefits to building green are living in a healthier, more cost-efficient and environmentally friendly home. Green homes' use of toxin-free building materials helps combat indoor air pollution, which can be much worse than outdoor pollution. Unhealthy air inside can pose serious health risks for residents, including cancer and respiratory ailments like asthma. Such non-toxic materials include wheat-derived strawboard, natural linoleum made from jute and linseed oil, paints with little or no volatile organic compounds and toxin-free insulation made from soybeans, recycled paper or even old denim. 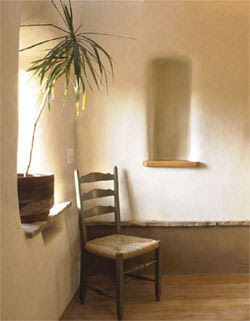 Green homes have far fewer problems with mold or mildew. Natural ventilation in green homes, as well as use of mechanical ventilation systems to filter and bring fresh air inside and vent stale air outside, keep residents breathing easy. The net cost of owning a green home is comparable to — or even cheaper than — owning a standard home. If upfront costs are higher, it is often because many architects, homebuilders, engineers, plumbers and other industry professionals just don't have the knowledge and experience to cost-effectively plan, design and build a green home. Finding a professional familiar with green-building techniques will save you money and ensure you're getting the best-quality work possible. 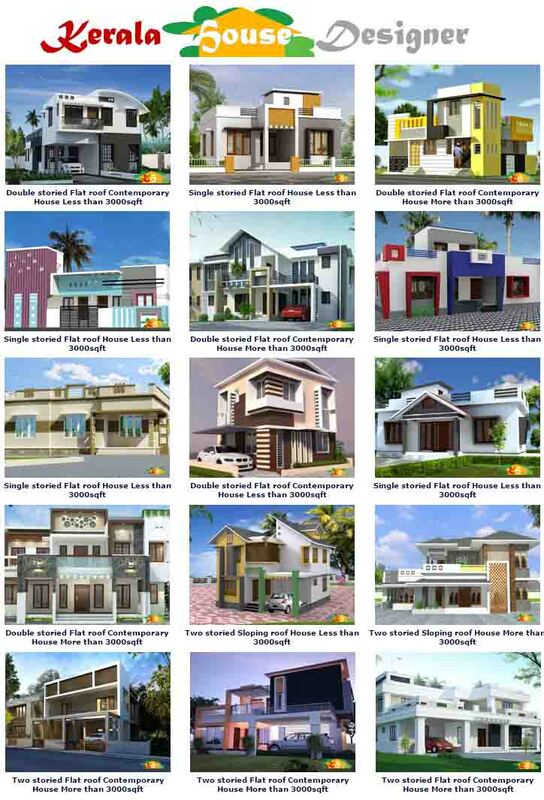 Examples in Kerala are- Habitat Technology Group, Costford (Laurie Baker), Nirmiti Kendra etc. Month to month, people who live in green homes save money by consuming 40% less energy and 50% less water than standard homes. Over the years, that adds up to big savings. A green home is more durable than most standard homes because of its high-quality building materials and construction processes, requiring fewer repairs. The value of a green home is typically higher than that of a comparable standard home, and the market demand for green homes continues to rise. Residential cooling and heating alone make up 10% of the Global energy use. Throw in household lighting, appliances and other electronic equipment, and homes are clearly a major source of energy consumption. Green homes use 40% less energy than comparable standard homes. Some green homes further reduce our dependence on conventional energy sources as they generate some or all of their energy needs through alternative energy sources like the sun, wind, geothermal energy and biomass. Efficient plumbing and bathing fixtures, drought-tolerant landscaping and water-conserving irrigation systems help green homes use, on average, 50% less water than standard homes. Far fewer natural resources are used in the construction of a green home. Many green building materials have significant recycled content. Some companies, for example, now make carpets and floor tiles from recycled tires and bottles. 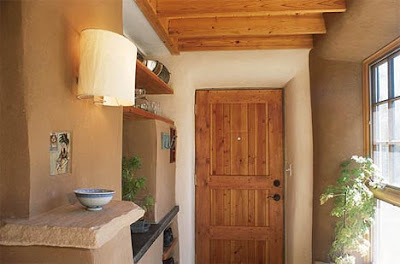 Green homes can also be constructed with salvaged materials from demolished buildings. Green homes use materials made from rapidly renewable materials, like bamboo, hemp, agrifibers and soybean-based products. And the use of wood that is certified by the Forest Stewardship Council helps promote socially and environmentally beneficial forestry practices.